When I reviewed TOMB RAIDER in theaters earlier this year, I gave it a favorable score in spite of the titular character lacking certain traits that defined the video games from which the film draws inspiration. Overall, it was a fun time and a vast improvement over the majority of video game inspired films. 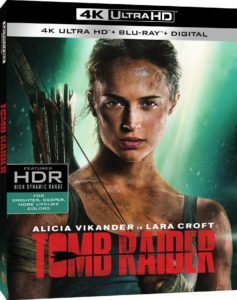 Three months later, TOMB RAIDER makes its way to store shelves in glorious 4K UHD resolution courtesy of Warner Bros Entertainment. “The filmmakers have wisely based this reboot on the 2013 game that jump started the franchise for players by giving us an origin story for the legendary heroine. Yet it also takes its time establishing itself as a film for the first 45 minutes before delving into its source material. Read the rest of my theatrical review here. Lara Croft (Alicia Vikander) dangles precariously off the wing of a rusty airplane in TOMB RAIDER. Courtesy of Warner Brothers Pictures. TOMB RAIDER joins the growing list of 4K titles derived from a native 4K digital intermediate and for the most part, it looks absolutely stunning in the format. Shots that stretch deep into the jungle are simply filled with detail and skin textures for close ups also feature a noticeable uptick in quality over the Blu-ray version. Little things like Lara’s hair or subtle tatters in her clothes easily pop out more and some of the computer generated set pieces even fare slightly better as well. Textures on set design also benefit from the increased resolution with the rusty shipyard or the clouds of dust at the dig site being specifically memorable. The inclusion of Dolby Vision and HDR10 is also a welcome improvement over the Blu-ray. While it’s not always incredibly noticeable, nearly every scene that takes place at night is wonderfully assisted by the improved contrast. The improved color pallet is especially apparent when Lara arrives on the island, as the sun baked cliffs very nicely contrast the dense foliage around them. The Dolby Atmos audio track is fantastic. Sequences like the shipwreck, the plane escape, and the climactic raid of Himiko’s tomb all benefit greatly from its inclusion. When the action eventually gets going, your speakers are in for decent workout. Overall, this is stellar 4K package. There are no extras included on the 4K disc, but the four features found on the included Blu-ray are certainly worth a look even if they are a little too brief. One feature in particular focuses on the evolution of Lara Croft as a character in the Tomb Raider game franchise that lead up to the 2018 film and it’s only fault is that it’s only nine minutes long. This subject could easily warrant its own full length documentary, but what’s there is still easily worth your time. • TOMB RAIDER: Uncovered – The cast and crew reveal the challenges and the fun of bringing Lara Croft’s thrilling adventures of life for a new generation. • Croft Training – Enter the gym with Academy Award-winning actress Alicia Vikander as she prepares for the most physically demanding role of her career and transforms into the iconic action hero Lara Croft. • Breaking Down the Rapids – Join Director Roar Uthaug as he and other members of the cast and crew break down the film’s most exciting action set piece. • Lara Croft: Evolution of an Icon – Explore the revolutionary TOMB RAIDER saga from video games to movies, and discover how Lara Croft became one of the most popular and successful female characters of all time. TOMB RAIDER is not a perfect film, but it is unquestionably one of the best video game to film adaptations around. If you’re a fan of the games, especially the 2013 reboot and its sequel, this film is absolutely worth your time.